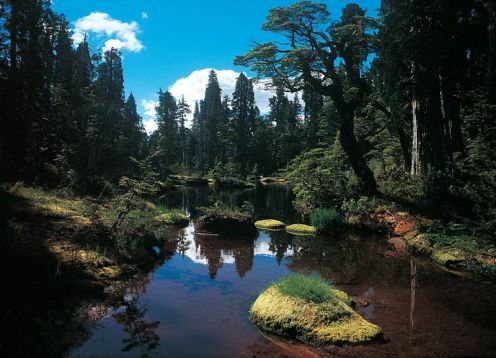 The Pumalín Park (290,000 hectares), located in the Province of Palena, X Region of Chile, is one of the largest and most diverse conservation projects in South America. It extends from the heart of the Andes to the fjords of the Pacific Coast. 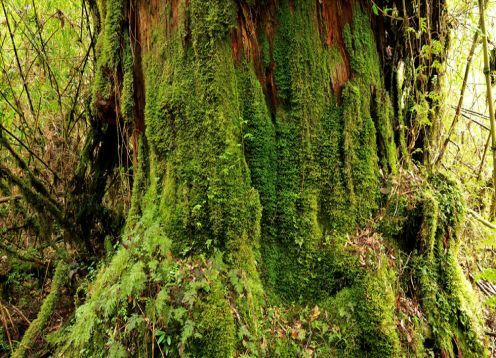 The Pumalín Project began in 1991, when Douglas Tompkins, originally from California, acquired the 17,000-hectare Reñihué Field to protect its native and virgin temperate forest, which was threatened by logging. Doug visited Chile for the first time in 1961, and returned several times to climb, ski, kayak and hike along the south. After spending years in the business world, as the founder of The North Face and co-founder of Esprit, he made the decision to contribute to the protection of the last remaining wilderness areas on Earth and combat the crisis of global extinction. 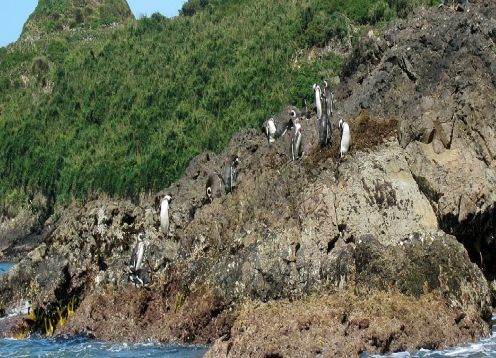 The vast and remote south of Chile, faced with numerous ecological threats, offered great opportunities to carry out large-scale conservation. 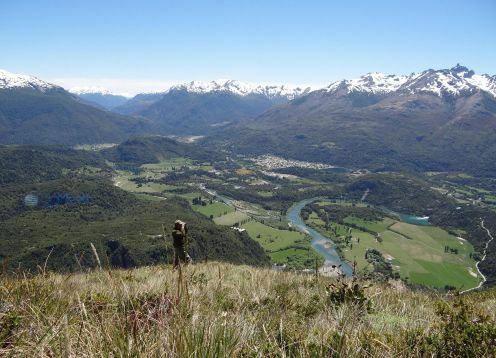 The vision of the Pumalín Park grew rapidly, until it included an extensive protected area with public access. Between 1991 and 1998, The Conservation Land Trust, the foundation created by Douglas, acquired about 283,000 additional hectares, 98 corresponding to absentee owners. To encourage Chileans and the rest of the worlds citizens to enjoy these spectacular and unique landscapes. CLT built a complex of cabins, camping sites, trails, information centers and other services for public access. Pto. Montt - Caleta Gonzalo - Chaitén: 7:00 a.m. Duration of the trip: 9 hours. The trip between Puerto Montt and Hornopirén has a ferry that makes several trips a day. Departures from Caleta La Arena (towards the south): 7:15 am, 10:15 am, 1:15 pm, 16:15 pm and 7:15 pm. Departures from Caleta Puelche (to the north): 6:45 am, 9:30 am, 12:30 pm, 2:00 pm, 5:00 pm and 6:30 pm. The crossing from Hornopirén to Caleta Gonzalo must be reserved prior to the trip and consists of two ferries, one from Hornopirén to Leptepu, and the other from Largo Fiordo to Caleta Gonzalo. 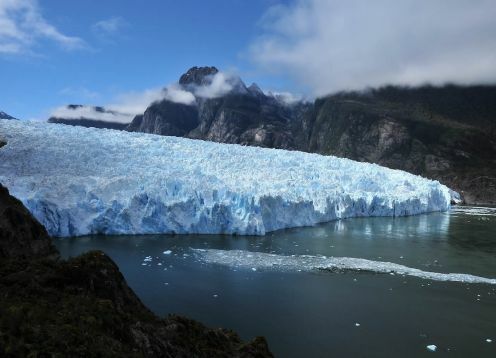 This means that the cars must drive the 15-kilometer road from Carretera Austral that crosses the Huequi Peninsula. If you are driving, you must make reservations in advance and must have the patent, name and passport number of each passenger. If you go on foot and are taking the ferry in Hornopirén, this company offers a bus that leaves from Hornopirén on the ferry, making the whole trip to Chaitén with stops along the way. If you are departing from Puerto Montt, Kémel Bus is the best option. 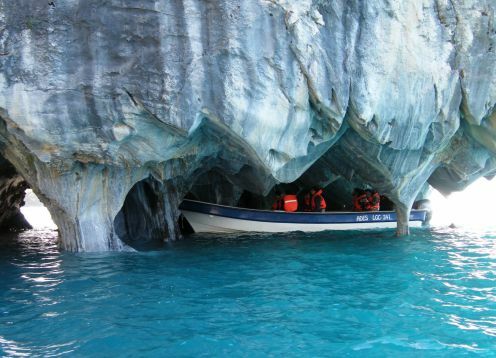 The trips from Hornopirén to Caleta Gonzalo are every day at 10:30 a.m. Path that crosses renoval sectors and wetlands, arriving in a gentle ascent to a small sandy beach on the shore of Laguna Abascal. Starting point: Cahuelmó estuary mouth, on the northwest shore. It is accessed by sea by kayak or boat from Cahuelmó, or walking from the hot springs when the tide is low. Time: 45 minutes one way, 45 minutes round trip. Distance: 2.3 kilometers one way, 2.3 kilometers back. Return: Return by the same route. The trail starts at Café Caleta Gonzalo. This hike, which takes you to a spectacular waterfall, takes approximately three hours round trip. The trail crosses lush rainforests, with ups and downs. 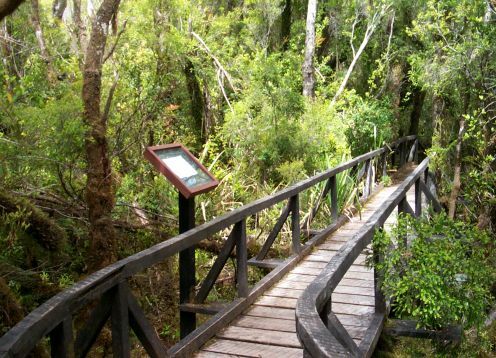 On the way you will enjoy a viewpoint where you can observe the Huequi Peninsula and kilometers of pristine temperate forest. To get to the waterfall you must cross the river by jumping through the rocks. Start place: 50 meters from the information center or the restaurant in Caleta Gonzalo. Distance: 2.8 kilometers one way, 2.8 kilometers return (5.6 kilometers in total). This trail starts 11 kilometers south of Caleta Gonzalo. It goes through a larch forest that was once burned and is recovering today. 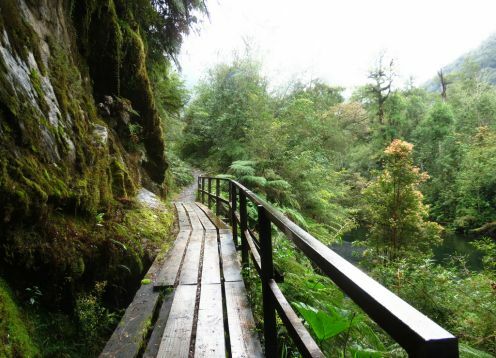 The walk begins with a series of stairs, going towards a suspension bridge over a waterfall on the River Tronador. From here, you can continue for another hour and a half until you reach a lagoon at the top of the mountain, in a kind of amphitheater. Time: 4 hours round trip. Distance: 2.4 kilometers one way, 2.4 kilometers return (4.8 kilometers in total). The entrance to this trail is near the Tronador, 12.5 km south of Caleta Gonzalo (45.5 km north of Chaitén). The trail is perfect for hikers of all ages. The road meanders through an ancient grove of larches with signs that give information about this species and its history. The circuit offers a calm and contemplative atmosphere to appreciate these millenary trees. It is possible to easily reach a live larch almost 3,000 years old. 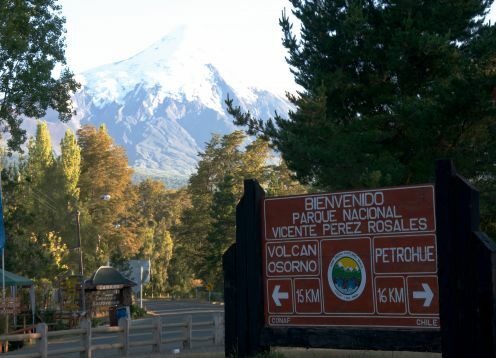 Starting point: Carretera Austral, 12.5 kilometers south of Caleta Gonzalo. Time: 40 minutes round trip. Return: It is a loop in a fraction of the way. It returns by the same route at the end. This trail begins 14 km south of Caleta Gonzalo (44 km north of Chaitén), in a small camping site. From there the path takes you to a total of three waterfalls. The first one is about 20 or 25 minutes up a hill. To get to the next two waterfalls above are another 30 minutes walking on a more flat path. When the weather is more rainy, walk with care. Starting point: From the Camping Cascadas Escondidas, 14 kilometers south of Caleta Gonzalo. Return: It is a loop in the upper part, it is returned by the same route in the lower part.